Please fill in all or parts of the form below should you wish to book or enquire about booking a holiday, refrigeration hibernation or over-wintering for your tortoise(s). Alternatively you can phone, email or write to Tortoises on Holiday. Details are available on the Contact Us page. 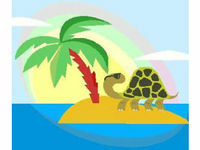 Your e-mail - Please provide an e-mail address so that Tortoises on Holiday can reply to your holiday and enquiry form. On receipt of your form, Tortoises on Holiday will reply to you with the relevant information including a quote for the duration of the holiday.